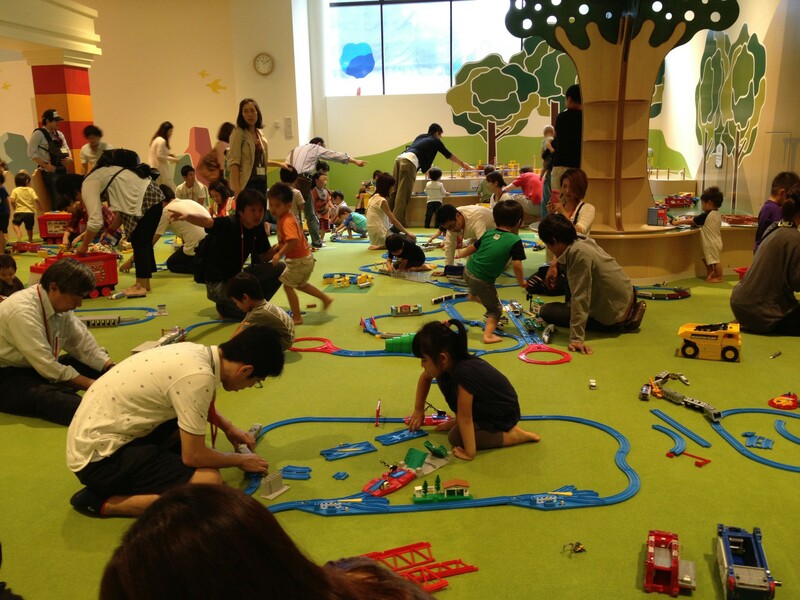 Here are our Top THIRTEEN Recommended Indoor Playcenters in Tokyo to escape the pouring rain, summer humidity and bitter cold for babies to teens. If you have a place to recommend, please leave a comment below. *Please visit the websites for changes in business hours and fees. 1. 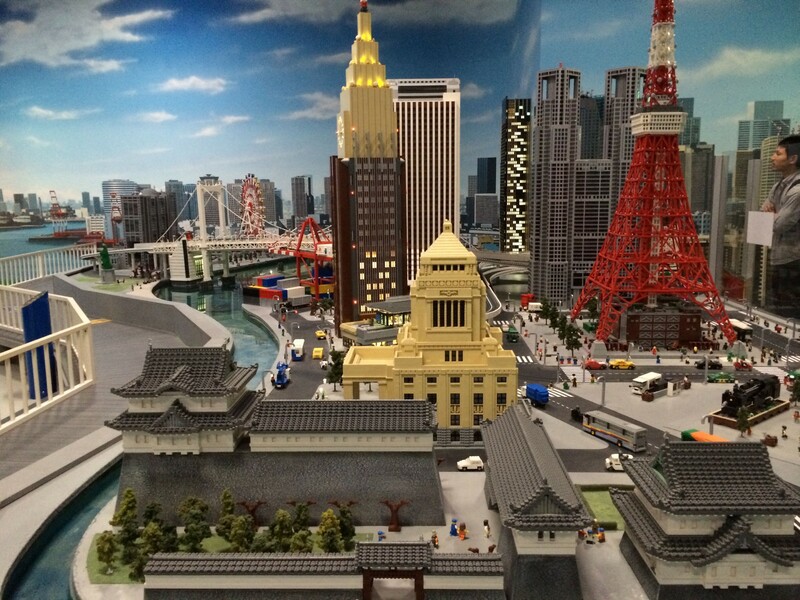 LEGOLAND Discovery Center is located in the Decks Tokyo Beach Island Mall in Odaiba. 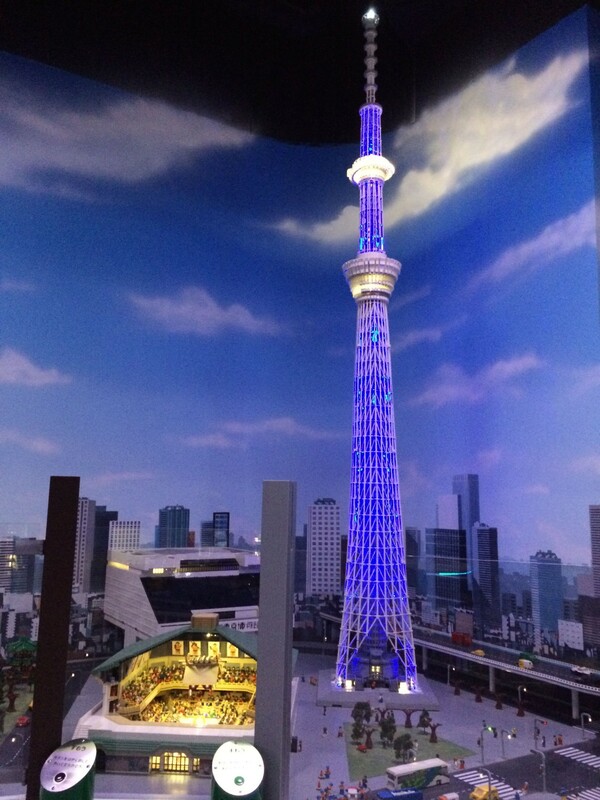 They offer a wealth of attractions; a miniature model of the Tokyo’s cityscape made from nearly 1.5 million bricks; a Lego-themed laser shooting ride; a Fire Academy & Construction Site with crawl spaces, slides; a duplo area with large, soft lego bricks to build with; a Lego theme park-like ride and so much more. 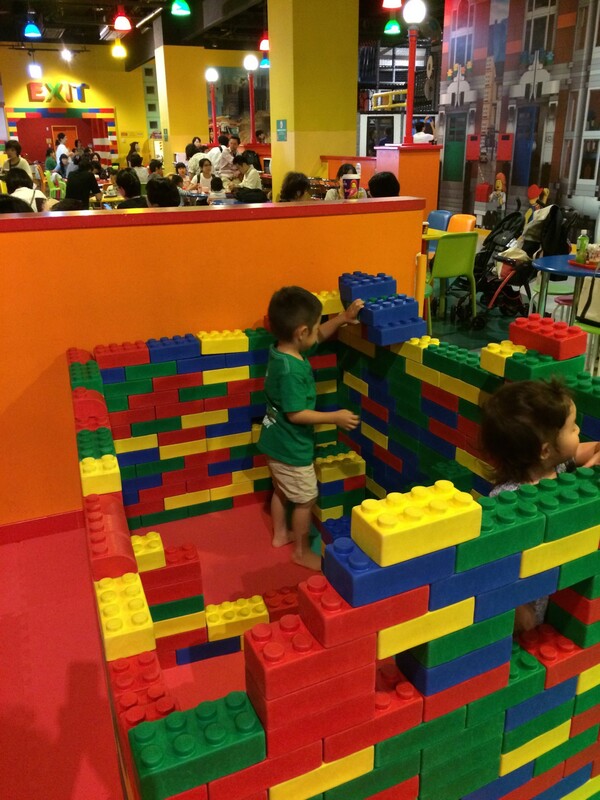 There are three play areas with Legos of all colors, shapes and sizes for kids to build with. The first, Duplo Village (for kids up to 5 yrs old) is stocked with large Lego blocks, a slide and lego-built animals; Lego Racers, a Build & Test area where kids can build their own Lego race car and try it out on three different test tracks; and Lego City Builders to add your creations to their already built lego models. Their virtual train section outside the Lego Store is a hit with train lovers. They also have Lego displays that change with the season and two booths to take photos in. You can refuel at their spacious Lego cafe and shop in their gift shop (get your parking ticket validated at the gift shop). Admission: At the door Child 3yrs – Adult 2300 yen, Under 2 years Free. Book online for discounts. * If you plan on staying in Tokyo for a year or more, I recommend getting the annual pass. It`s the price of three visits. Your family will avoid the long lines and you`ll receive a coupon book for use in the facility. 2. 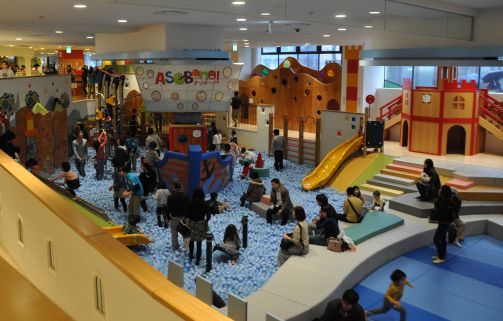 ASOBono at the Tokyo Dome is one of the largest indoor playcenters in Tokyo with areas for babies six months old through elementary. They charge a flat rate for parents, and a 60 min rate for children with an additional fee each 30 mins. My personal experience is that you will not get out in 60 mins; two hours is about right. 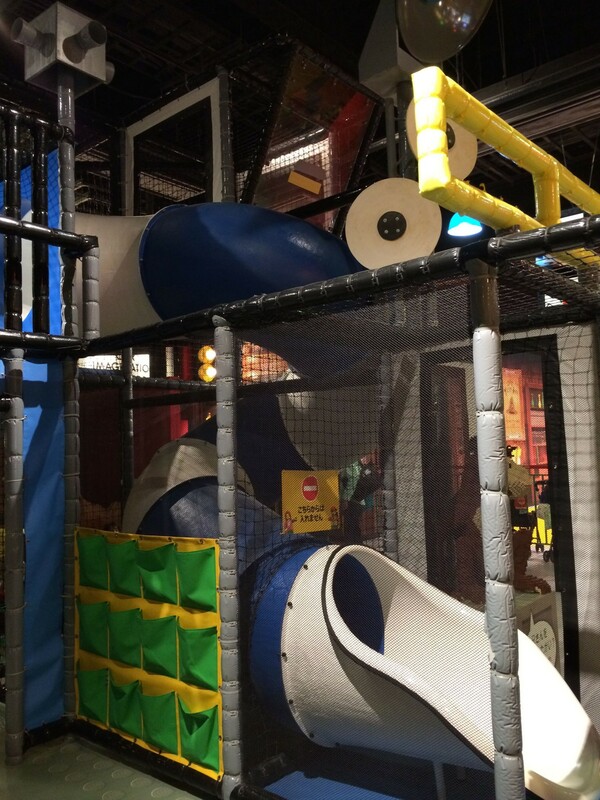 There is a massive climbing and sliding area that has balls for the kids to slide and and drop. If you have a 6-24-month-old, you will enjoy the baby exclusive area with mini ball pit. There is also a library, building structure area, an enormous area with cars, trucks, tracks and battery operated trains, and much more. ASOBono has a strategically placed gift shop with many toys so don’t expect to go home empty handed. Good place for 1-2 hours. If you go on a cold or rainy weekend expect to wait about 15-30 mins. 3. 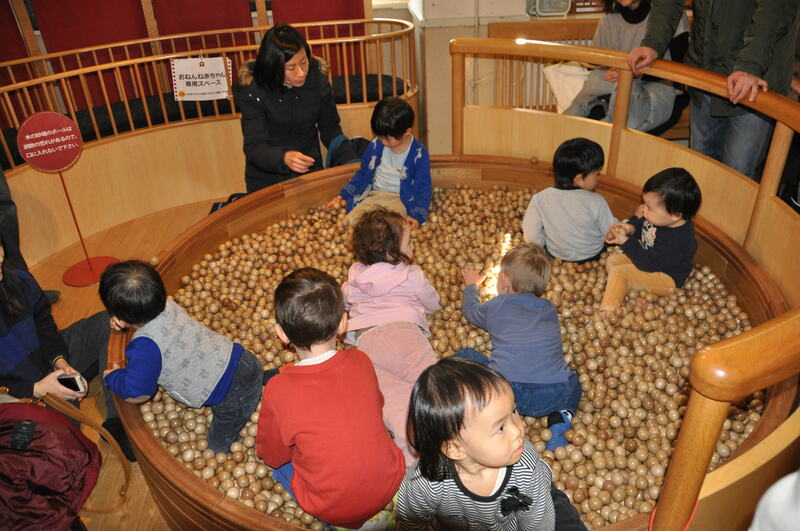 Tokyo Toy Museum (TTM) is called a museum, but in reality it is a hands-on, play all you want center for babies and up. The toys are all analog toys mostly made from wood, and original Japanese toys. 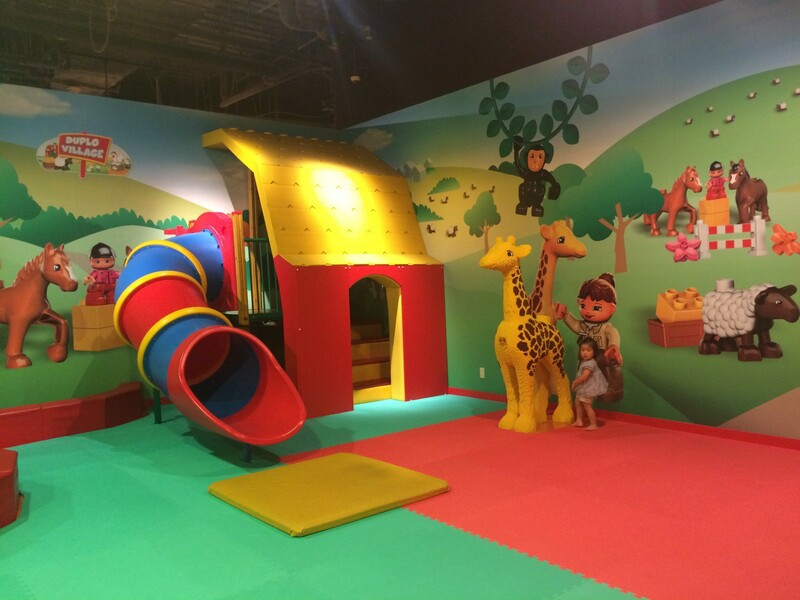 There are age appropriate rooms throughout the facility to keep you and your kids busy for a few hours. Wooden Baby Room – This room was out favorite. 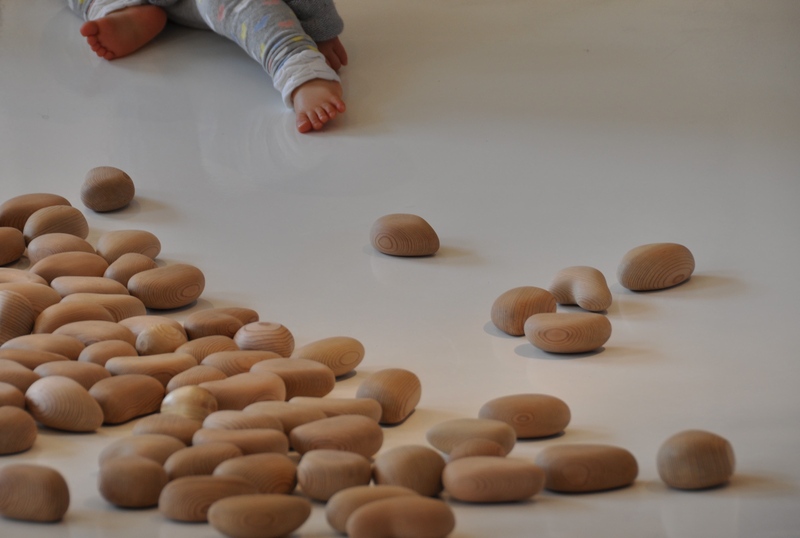 It is specially designed for babies aged 0-2. Baby enjoyed all the wooden pull and shape toys and bright scarfs. Babies were crawling all over the place having a wonderful time using the wooden slides, tunnel and baby toys. Toy Square Red – This room painted bright red is filled with traditional Japanese toys! Great chance to get hands-on learning of cup-and-ball, beanbags and spinning tops. If you do not know how to use a toy, one of the red aproned volunteers will aid you. 4. Aneby Trim Park is a great place for parents and kids (0-12 years old). Conveniently located in Venus Fort, you can easily spend the day shopping and dining, and the kids can enjoy a couple hours in the indoor play park. The name TrimPark came for the concept of “trimming” a sail; keeping balance and control. The facility offers trampolines, extensive climbing gyms, a peddle go-cart area, play food area, and many other activities for kids. The facility is located on the first floor of the Venus Fort in Odaiba which has plenty of parking and is right near the train station. – And they keep adding more! Toilets: Provided on site for babies and kids under 6 years, kids above 6 and adults must use public toilet in Venus port. Child friendly: Yes, strollers and wheelchairs ok, also lockers provided in the facilities for bags. 5. 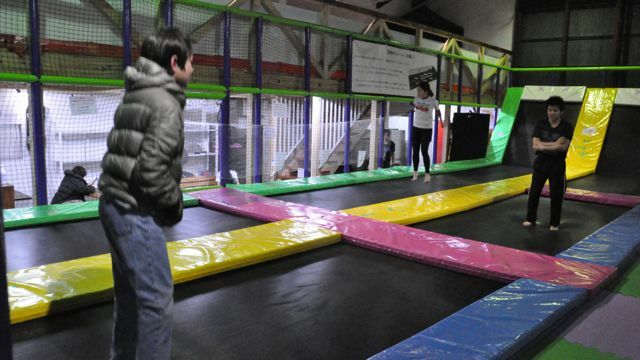 Trampoland is an indoor trampoline center that is safe and fun for elementary aged kids and up. My 11-year old son and I went the other night and had a great time for 60 mins. The gym was quite cold at first, but after 30 mins of jumping he was down to his t-shirt and perspiring quite a bit. Great way to burn off energy. One of the Trampoland workers came into the trampoline pit and helped him get going, and showed him some tricks. Trampoland expanded with a Trampoland in Saitama, which is nine times bigger than this Itabashi branch. The Saitama Trampoland also has parking for over 30 cars. You can also rent the space out if you have a group of 12 or more for parties. Costs: 1st time registration fee ￥540（税込 w/tax), then 30 mins 1,080 yen, 60 mins 1,620 yen, 90 mins 2,160 yen. 6. 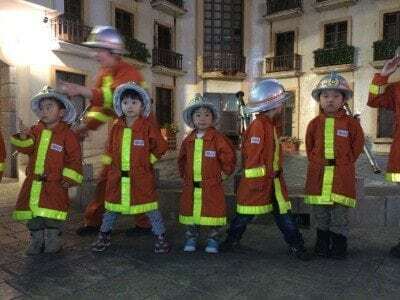 Kidzania Tokyo, located at the Urban Dock LaLaport in Toyosu, is an indoor theme park for families. The park is a city built to scale for children complete with buildings, shops, paved streets and vehicles that look like everyday workplaces in Japan. Children aged 3 to 15 years old perform jobs and are paid for their work. Jobs include a fireman, doctor, vet, pilot, police officer, model in a fashion show, dancer, cook, baker, etc. There are over 90 jobs to choose from! It`s excellent for learning role-play, how society works and just having fun. “English Wednesday!” is their program held every Wednesday with nearly half of the Activities in English as its core feature. There are over 30 to choose from! Remember to book ahead as this is a popular program. Read our TIPS for first time visitors. Fees: Vary with age and shift. Please visit their website for details. 7. Miraikan in Odaiba is a great place to spend a half day. The official name is The National Museum of Emerging Science and Innovation. Great interactive exhibits about the universe, solar system, robotics and the human body today and future. The Ideal age for the permanent exhibit is age 6 and up (my two-year-old would have been very bored). The special exhibits are for ages from 3 and up, but age 6 and up would be better. The Miraikan website states that Miraikan is a place where we can understand the things happening in our world today from a scientific point of view and have discussions while considering the future that awaits us. We believe that science and technology are part of our culture. We provide an open forum for all to ponder and discuss the future roles of science and technology. The organisers have done a wonderful job explaining in Japanese and English various aspects of science and technology. Our favourite exhibits were the ocean submarine, new human cell exhibit, future city and human body operation exhibit. Robots and androids were also “pretty cool” according to my 11-year-old. Visit their website for special exhibits. 8. 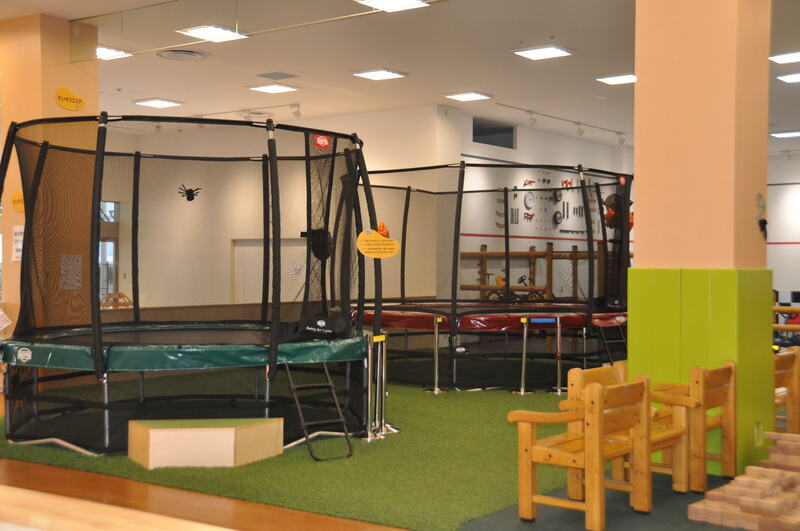 PEKIDS Climbing Center in Shibuya or Spider in Minami Azabu are great spots to let your kids burn off energy climbing the walls for a few hours. My Baby (age 3.5 years) loved the challenge. The PEKIDS Climbing Center is designed for ages 3 through elementary. There is also a little zone for 0-2 year olds to enjoy while siblings are climbing. This is also a great place to rent for a private birthday party. Kids can borrow indoor climbing shoes and then challenged themselves on various levels from very easy to difficult. Colors of the climbing step pegs indicate a level of difficulty. The facility is very well run and extremely clean. There is also an onsite bathroom. A great options if your kids need to let off some steam. Grab a coffee and watch your kids go crazy. around having a carefree and fast speed time. 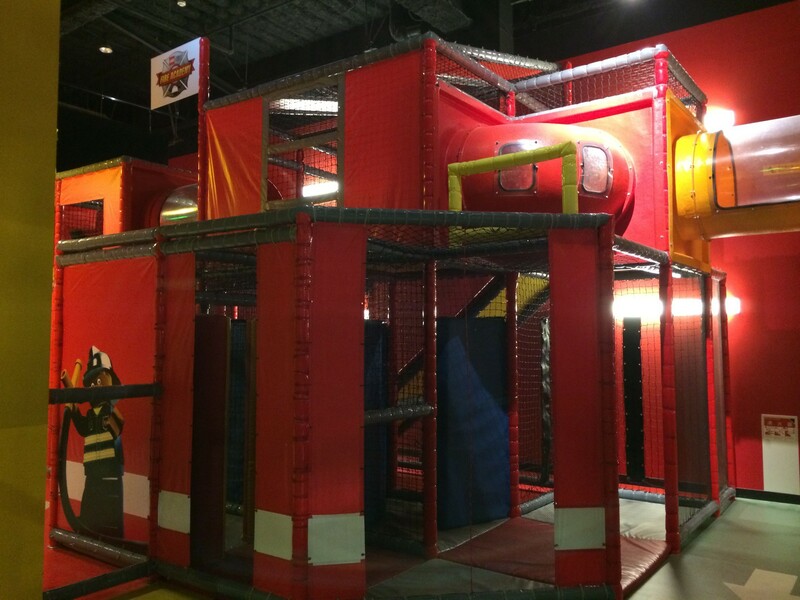 The most popular play areas are the ball and climbing pit, and the inflated bouncing road and ball. If you need a little slow time there are also great creative spaces to build and design. We usually spend the first 30 mins running around and bouncing, and the second 30 mins on quieter activities. After 60 mins my four-year-old is ready for lunch at the food court not the same floor, or for a snack on the roof garden. 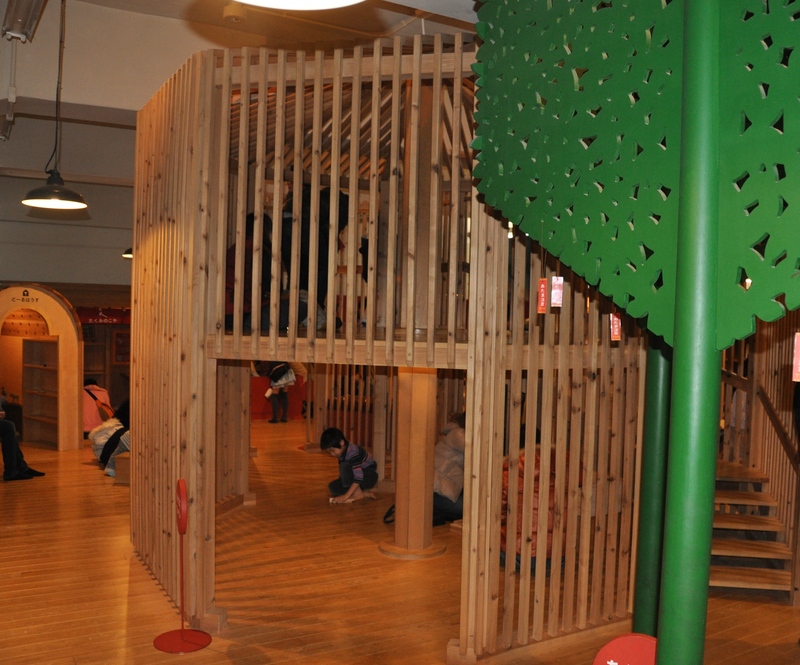 Playground Shibuya Kids is an indoor play space, located in Shibuya Tokyo, which opened in January 2016. 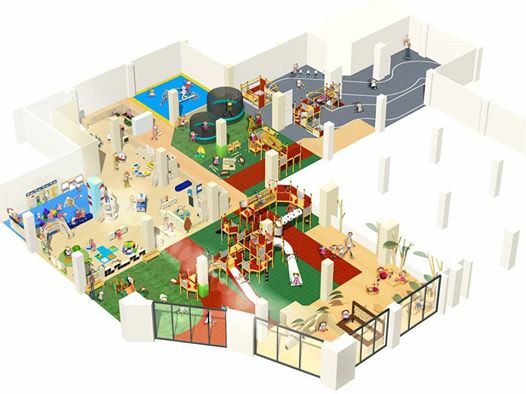 The space is compact but filled with colorful hands-on toys, climbing and bouncing equipment. Playground Shibuya Kids was opened by a Japanese mom who has a toddler and struggled to find fun places for her little one to safely play indoors. You can play and pay as you go, or rent the entire space for private parties. 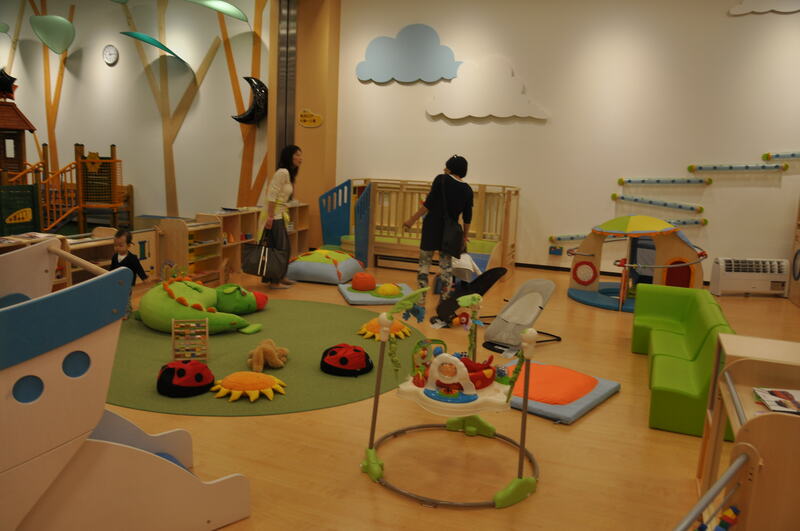 A great new baby and toddler indoor play option in Tokyo for residents and visitors. Business Hours: Saturday – Thursday 10:00 – 18:00; Evenings and Friday open only for private parties. Cost: 300 yen registration fee on 1st visit (you will receive a membership card/point card). 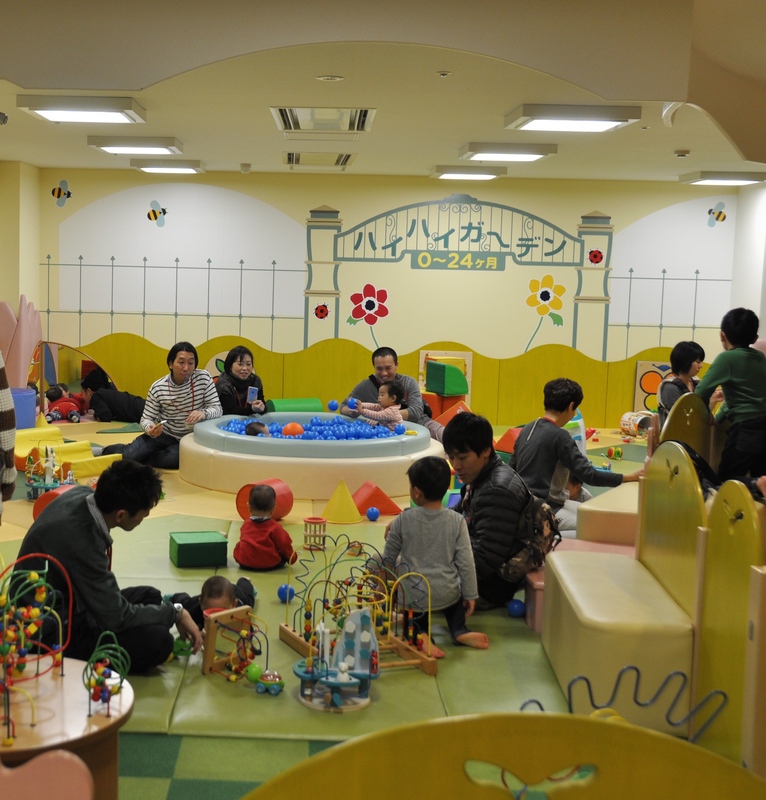 Kids under 6 months are free; children over 6 months are 1,000 JPY per hour on weekdays, and 1,200 JPY per hour on weekends. Children who spend over one hour will be charge per 15 mins at 1/4 of hourly charge. 500 JPY per parent on entry – does not increase with time spent. Private parties are 2 hours for 30,000 JPY (up to 20 people, you can bring your own food and drink – no alcohol). Note: When you enter the Konami Sports Building you must register once with the front desk then proceed to the 9th floor. Baby changing room are available. You can park your stroller on the 9th floor. Also lockers are available. 11. The Tokyo Water Science Museum: a great FREE hands-on, educational museum that takes about 60 – 90 minutes to tour depending on how much Japanese you can read and how much time the kids want to spend at the exhibits. Let your kids play with water toys and a spray gun while parents/guardians relax in the seating area located at the far end of the pool where they showcase a film library, kids` artwork and water trivia while the kids play. The Museum has very limited English instruction, but it is not that hard to figure out the basics of what is trying to be explained. Business Hours: Monday – Friday 10:00–18:00; Sat, Sun & Holidays 10:00–19:00 (last entry an hour before closure). Please check the website for special closures. Cost: 330 Yen Membership Fee for Adult; 530 JPY/per person/per hour OR 1050 JPY/per person for a day pass with re-entry. Membership to be renewed annually. Access: 35 minutes by car. 55 minutes by train. A 7 minute walk from Center Minami Station. Parking: In the building. The first 3 hours are free (must validate ticket) then 100 JPY per 20 minutes. 13. Kandu is an indoor theme park similar to Tokyo`s Kidzania where kids aged 3 – 16 years can work a variety of jobs and get paid for them. Some of the jobs include a JAL Airlines pilot, JAXA Space engineer, architect, takoyaki chef, soup maker, cold stone ice cream maker and more. Located less than an hour drive from central Tokyo it’s a nice alternative to Kidzania.